Before you know it, you’re working underneath a floorboard plumbing between joists, or threading pipes through a wall behind a kitchen sink, with very little room to manoeuvre. And as modern buildings are built in favour of style over convenience, these spaces are only becoming tighter. Few customers want pipework on display anymore, meaning that a plumber’s work is often hidden out of sight in small spaces in and around a building. Fear not! There is one way out of this tight space. Whilst some plumbers and installers still struggle with rigid copper pipes, and multiple tools, many have already embraced the flexibility and versatility of plastic pipes and fittings such as those in our Speedfit range. A plumber’s van can be very low on storage space when copper is favoured over plastic fittings. Not only do they need to store fittings and pipes, but all of the tools required to connect and install these as well. Specialist cutting tools are required, and blow torches must be carried around to make connections, not to mention the various sealing agents that plumbers need to have access to. These all have to be transported from the van to site, but where do you put them when the only storage space you have is the few metres between you and the pipework? A plumber using plastic pipes and fittings has a much lighter van, and considerably fewer tools to carry. 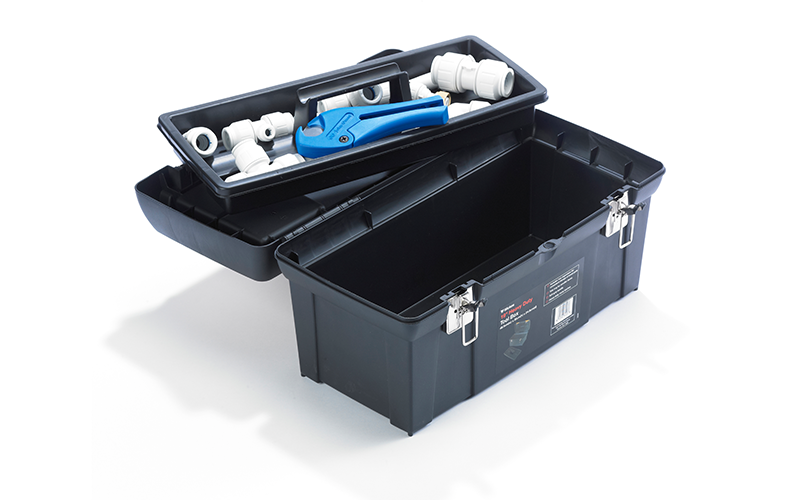 This is because plastic pipes and fittings by JG Speedfit do not require any specialist tools to install. 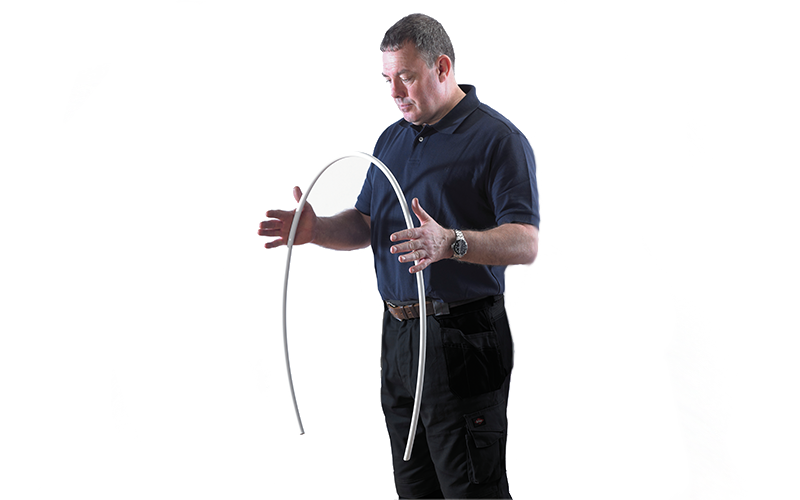 In fact, with our revolutionary push-fit fittings, you only need your hands and a sense of touch to make a secure, leakproof connection. When inserting a pipe into a fitting, a screw cap is placed in an unlocked position, allowing the pipe to be easily inserted as the collet allows for low insertion force. Once the pipe is fully connected, the nut is rotated and this important twist and lock action is what causes the internal components of the push-fit to compress, creating a leakproof connection without the use of tools. Further reducing the volume of products that a plumber needs to take onto a site, plastic pipes can often cover more ground than copper alternatives. Single plastic pipes can be installed over longer distances than copper pipes, which is often only available in maximum lengths. In contrast, it is possible to have a 300m coil of plastic pipe which you can stretch across a floor for an underfloor heating installation. Longer pipes mean fewer connections are required, which ultimately means that a plumber needs to transport fewer fittings to a job. In contrast, it is possible to have a 300m coil of plastic pipe which you can stretch across a floor for an underfloor heating installation. Longer pipes mean fewer connections are required, which ultimately means that a plumber needs to transport fewer fittings to a job. When faced with a tight working space, it is important to ensure that you have as much flexibility as possible when performing an install. This can be difficult to achieve with pipes and fittings that are not manufactured from plastic. Plastic is a flexible and versatile material and products such as JG Speedfit’s Layflat pipe can be easily threaded through joists and small spaces where copper pipes cannot. It’s not uncommon with modern buildings to have one installer threading a plastic pipe from one floor, down to a colleague on the floor below. Likewise, lots of modern pipework is now installed inside airing cupboards, where pipes need to be threaded down to floors. It is widely acknowledged in the industry that there is much greater choice afforded to plumbers when they choose to work with plastic pipes and fittings, than if they select copper products. Furthermore, plastic fittings become even more versatile when you start to introduce reducers. These allow for a change in pipe size to meet the specific hydraulic flow requirements of a plumbing system, whilst also enabling plumbers to adapt fittings to existing piping of a different size. When you add this versatility to a range of pipes and fittings that are already vast, you can always find the right products for each individual job. OK, so you probably shouldn’t go around installing pipework with your eyes shut, but there are some instances when working in tight spaces where you may not be able to physically see the pipes you are connecting. This can make soldering copper pipes together something of an impossibility, but with plastic, it’s not a problem. Whilst it is important to perform a visual check to ensure that there is no insertion gap when connecting pipes, this is not always possible. For example, you may be working on a cold building site at 6 am on a January morning on a stepladder. With plastic push-fits, you can be assured that 99.9% of the time, when you twist and lock the fitting, a secure connection has been made, due to the unique design of the push-fit, and the compression lock that it creates. That’s just five ways our plastic pipes and fittings are making plumber’s lives easier as the industry is being forced to work in tight spaces for plumbing projects. 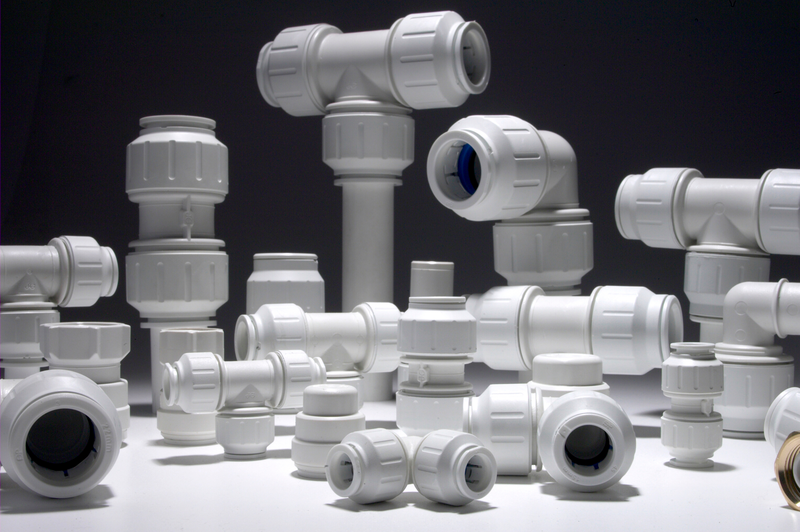 View our push-fit plumbing pipes and plumbing fittings. We’d love to see some of the tightest spaces you have installed our products into. Share your photographs with us on Twitter at @jgspeedfit.